English for Spanish speakers has never been this easy! This book and digital download is the perfect blend of education and entertainment; success and fun go hand-in-hand! 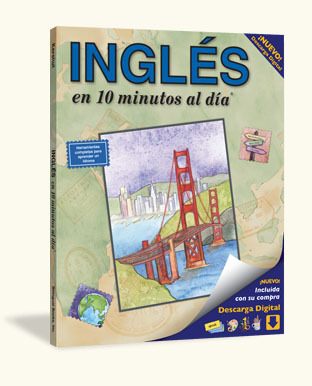 Specifically created for Spanish speakers who are visiting or moving to where English is spoken, INGLÉS en 10 minutos al día® is organized into 25 practical categories to teach the everyday necessities for finding one’s way around in an English-speaking country. 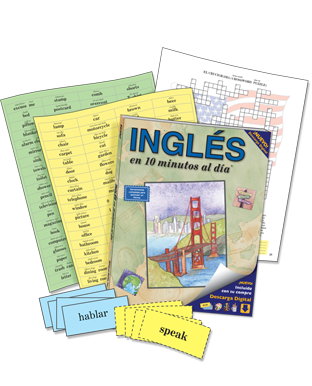 Computer activities, word games, puzzles and tests make this book and software combination excellent for self-study and the perfect learning aid for introductory level English as a Second Language (ESL). The 10 minutes a day® Series is your first step in language learning. This program lays the groundwork to springboard you to the next level. You’ll understand how the components of the language work so you’ll have the freedom to use the language for any situation. The 10 minutes a day® proven methodology guarantees success—all you need to do is set aside 10 minutes a day and you’ll be on your way. Why 10 minutes a day? Because 10 minutes is doable, it fits easily into your life and it’s not overwhelming. The program is designed so you can work at your own pace. You set the pace and you decide when you’re ready to move to the next Step. The book is purposely designed to look like a child’s workbook—it’s not intimidating or overwhelming. Instead, it’s approachable and engaging for everyone at any age. The vocabulary hones in on key essential words that you’ll actually use when traveling. You’ll learn Key Question Words so you can ask for what you need; money and numbers so you can shop and pay bills; directions so you can get to your destination smoothly, and so much more that will make your experience in an English-speaking country enjoyable. The 132-page illustrated workbook: Use the book to guide you, step-by-step, through learning and speaking English. 150 Sticky Labels (both in the book and for your computer): Place the Sticky Labels around your home and office to learn new words without any extra time or effort. Use the interactive Sticky Labels module on your computer to hear the words, review, keep track of your score and improve. 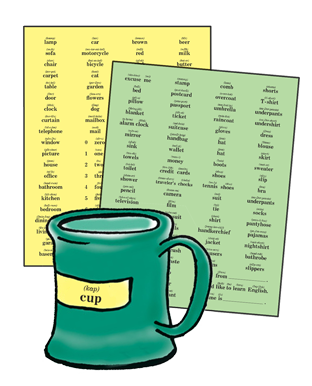 Pronunciation Guide: Special phonetics accompany each new English word. The phonetics have been carefully selected and tested for Spanish speakers, so the correct sounds are accessible and the learning process is easy. With the phonetics above each English word, Spanish speakers can use the correct pronunciation on the very first day. Over 300 “Free Words”: Sounding similar to their Spanish counterparts, these English words take no extra effort to add your vocabulary. Glossary of over 2,000 new words, definitions, and pronunciation: You can quickly look up an English word, its pronunciation and definition. English is spoken in . . . American Samoa, Anguilla, Antigua and Barbuda, Australia, Bahamas, Bahrain, Barbados, Belize, Bermuda, Botswana, Burnei, Cameroon, Canada, Cayman Islands, Christmas Island, Cook Islands, Dominica, Fiji, The Gambia, Ghana, Gibraltar, Grenada, Guam, Guernsey, Guyana, Hong Kong, Iceland, India, Isle of Man, Ireland, Jaimaca, Jersey, Kenya, Kiribati, Lesotho, Liberia, Malaysia, Malawi, Maldives, Malta, Marshall Islands, Mauritius, Micronesia, Monaco, Montserrat, Namibia, Nauru, New Zealand, Nigeria, Palau, Philippines, Pitcairn Islands, Puerto Rico, Qatar, Rwanda, Saint Helena, Saint Kitts and Nevis, Saint Lucia, Saint Vincent and the Grenadines, Seychelles, Sierra Leone, Singapore, South Africa, Sri Lanka, Swaziland, Tanzania, Trinidad and Tabago, Turks and Caicos, Uganda, United Kingdom, United States, Vanuatu, Virgin Islands, Zambia, and Zimbabwe.